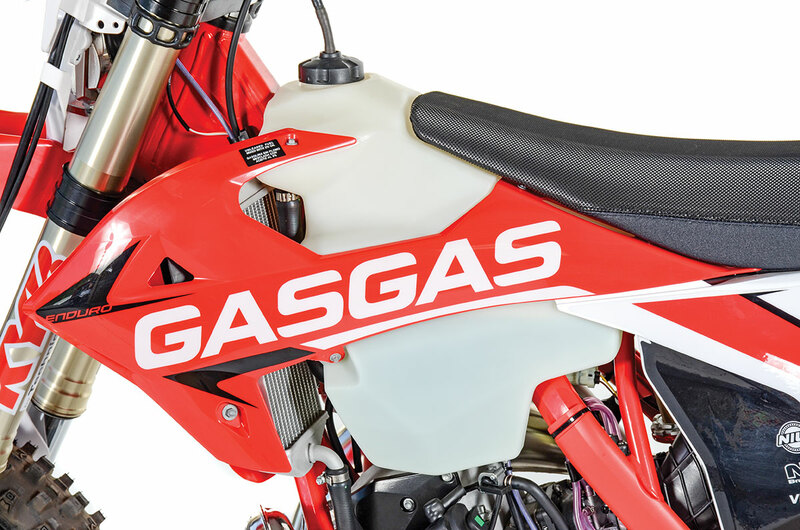 Gas Gas, a Spanish company on the brink of disaster several years ago, has reentered the hard enduro market with a serious effort funded by new owner Torrot. 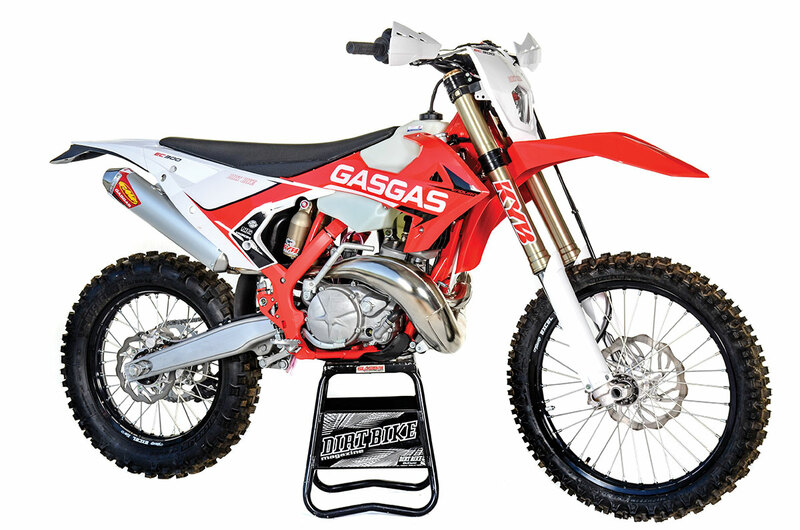 With increased manufacturing capabilities and an infusion of cash, the Gas Gas has crawled back into the ring as a viable machine for the two-stroke enthusiast. Its machines are players in the arena. 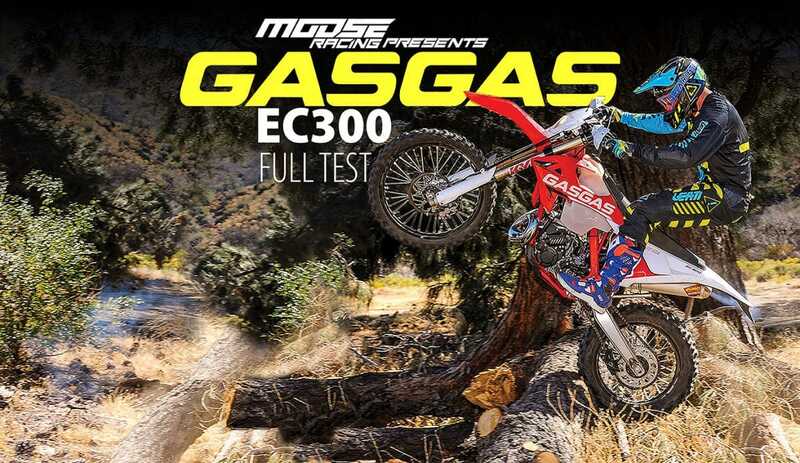 The 2019 Gas Gas EC300 underwent a major transformation in 2018. Gas Gas shelved the old steel perimeter frame and went with a new chromoly backbone frame. This made room for a good-sized yet slim fuel tank and resulted in a good feel with proper flex points. 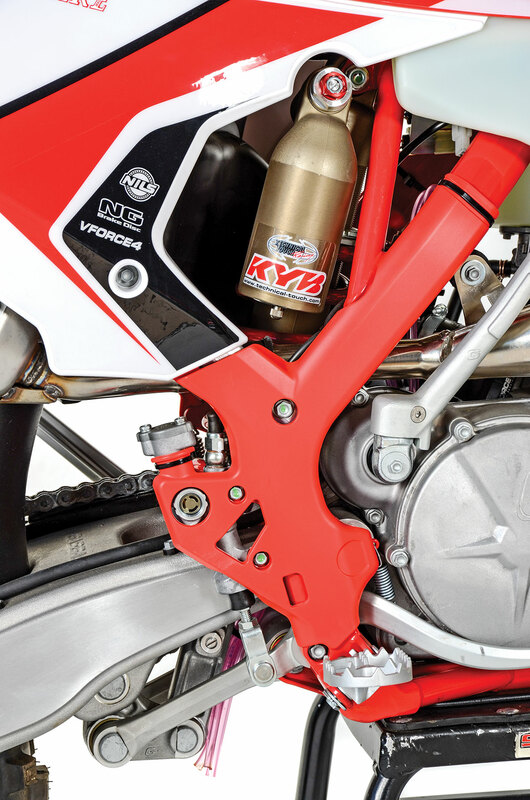 Gas Gas ditched the Marzocchi and Reiger suspension units in favor of KYB dampers, with the front being the AOS cartridge unit that has been highly praised for both feel and damping versatility. The engine is a case reed design, electric start (along with a kickstarter), and carbureted by a Keihin PWK-38, which flows into a V-Force reed assembly. The EC300 is their enduro version, equipped with lighting and hand guards. Nissan brakes, Excel rims, a plated pipe, FMF muffler all help form a slim and ergonomically sound machine. In 2018, Gas Gas updated the crank, cylinder, piston and head. For 2019, more work was done on the head to promote strong, tractable, off-road power. It’s a six-speed. The clutch is a Magura hydraulic unit. There’s a dual map switch with Sun and Rain mode. The Sun mode offers full torque delivery, while the Rain mode puts out a softer band of power that focuses on tractability. The expansion chamber tucks up nicely and is plated. The exhaust flows out of a longish FMF silencer. Up top in the cockpit, Gas Gas fit up a bulge bar, Neken grips, roost deflectors and an old-world-looking switch that houses the electric-start button, horn (yes, this machine can be street-legal in Europe), turn signals, enduro lighting and a fancy electronic odometer. Nissan brakes, Excel rims, Michelin Enduro tires and a quick-access air filter are stock items, as is the tight, out-of-the-way side stand. Overall, there was a serious weight reduction over the pre-2018 EC300s, which made the DB scales sweat with a tonnage over 250 pounds (sans fuel). The new model is a little over 17 pounds lighter. Starting—wham! Punch the button on the weird, cylindrical, multi-function switch and it lights up immediately. The machine is carbureted and naturally has a choke function, but all we did was turn on the gas and stab the button. The exhaust note is subdued thanks to the longish FMF muffler, but, remember, it has no spark arrestor. This machine, like every other two-stroke in this niche, is a closed-course competition machine since it does not meet EPA standards. When you pull on the clutch lever, the action is silky and light. Snick it into gear and the engagement is where you want it with proper feel and fluid delivery. First gear is nicely spaced and used for the tightest of conditions. Second gets worked severely in the woods and craggy terrain, and it, too, pulls low enough and long enough to handle the normal obstacles faced by the enduro guy. Sixth gear is basically an overdrive and lets you cruise at good speeds without pushing the engine too hard. Top marks go to the KYB suspension. 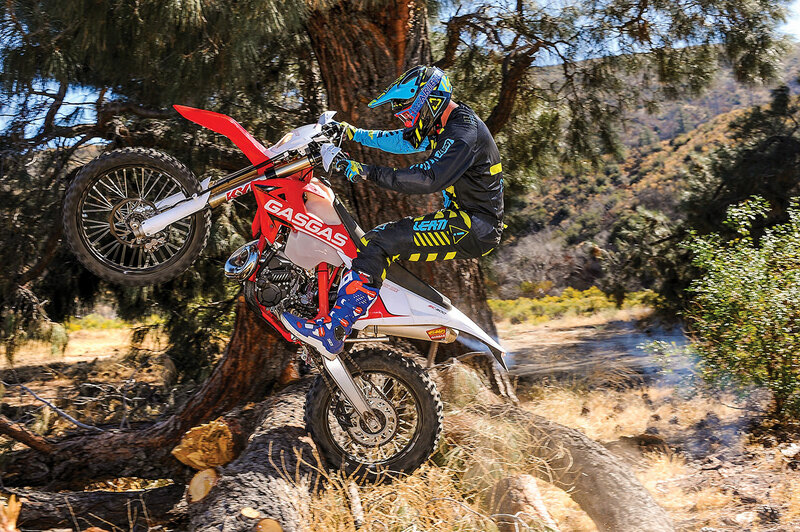 The machine craves a wide variety of off-road carnage, rewarding the rider with a balanced ride. Power wise it’s a little soft on roll-on, is pretty meaty in middle and makes decent boost on top. We found the stock jetting a little fat, lacking the slam we wanted in the middle. It was a little choked when we let it rev. We dropped the needle position one and went from a 172 main jet to 170. This cleaned things up nicely. Our initial testing was all done in the Sun map, which made for the most power. It has decent bottom power, but it is not overwhelming. Compared to the KTM 300 machine, it is definitely softer. But, strong middle power mates to a competitive mid-hit, and the EC 300 yanks quite adeptly when you keep it pinned. There’s a bit of vibration, especially when compared to the KTM/Husqvarna machines that are equipped with a counterbalancer. We got a case of numb hands on long rides, which is very normal for most two-strokes. The counterbalanced Austrian machines have upped the ante here, since they are virtually buzz-free. We never felt that the EC300 lacked the power to handle our test terrain. Better riders would have preferred more low juice but ached for a stronger hit in the middle. Riders looking for traction would have preferred more roll-on, as out of the hole the power is smooth but not really strong. Then, when you get on it, the transition is robust. Our high-end testers adjusted the power valve settings so they would feel more hit. They felt it was better for extreme terrain where a stab at the clutch and belch of boost would get them over obstacles. The more trail-oriented testers actually switched to the Rain mode on the map settings, as this smoothed out the flow of power and let them hunt for traction. In the Rain mode, the hit is tempered, the flow of power is fluid, and it feels a little meatier really low in the powerband. The machine has a heavy crank feel, so it doesn’t stall easily, though we did play with the idle since it would die on long, slow downhills. Running weight, no fuel 233 lb. In the handling department, the Gas Gas EC300 has a serious side. The machine, almost 15 pounds heavier than a KTM, doesn’t feel thick-waisted. The ergos are slim, mobility is excellent and positive cornering mates to a very planted feel. Our expert testers felt that they couldn’t turn tight enough, as the stop-to-stop steering lacked the width they wanted. Our average guys never experienced this drama. Still, once you get into the suspension character of the machine, good things sprout. The KYB dampers are seriously good right out of the box. The KYB AOS front fork is stiff enough for a pro extreme racer, yet chews on chatter and rocks with a good appetite. There is no ugly fork dive when you chop the gas; it stays up and out of holes and rewards the pilot with a very polished, smooth and plush-enough ride. Our trail-oriented testers felt that the fork was fairly cushy, but, more important, it stayed up in the stroke and took the midrange hit extremely well. On full bottoming, there was no clanking, and the fork did not dive in sandy conditions. They rated it as excellent! Our testers’ feelings about the shocks closely mirrored their sentiments about the fork. The KYB shock and linkage design target traction. The suspension stays up in the stroke, swallows trail hack without gagging and allows you to concentrate on conquering terrain rather than wondering if you’re riding like a geek. We set the sag at 102–105mm, and in high-desert technical conditions, it responded with a planted feel and good manners at speed. At first, we were going to ditch the Michelin Enduro rubber for something that we know works in our conditions, but we were pleasantly surprised with their grip and feel. Part of this is due to the balanced handling traits of the Gas Gas, but the tires did not hold us back. The saddle is a one-bolt-to-remove-it affair. It’s on the left side under the side panel. It’s unusual but works fine. As for the seat itself, it’s firm and has a decent cover with good grip. There were no complaints with the bar bend, but we wouldn’t mind a system that offered a little cush and maybe took some of the vibration away. The grips are glue-on models and they felt just fine. The Magura controls are excellent. The adjustability at the levers lets them work for all-sized paws. We had to fumble around for a bit trying to figure out the electronic odometer, finally downloading a PDF from the website to get directions. 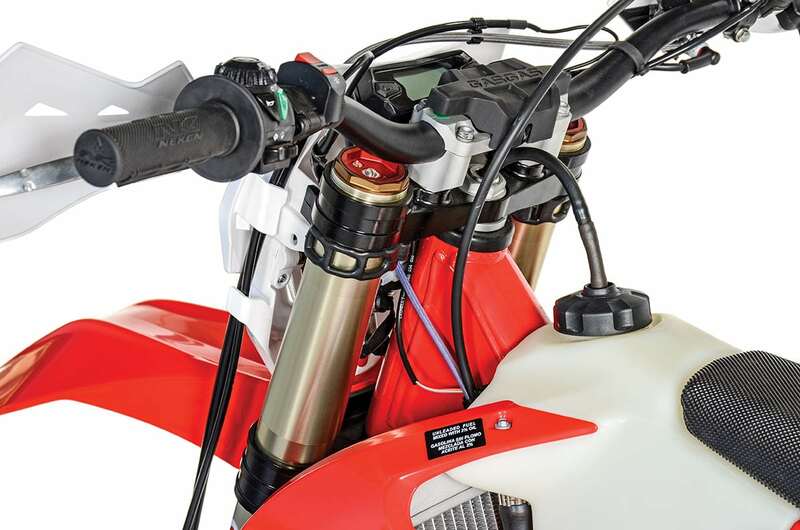 While the handguards offer some protection, their mounting design is suspect and looks weak. Both brakes are strong performers with good feel and strong power. 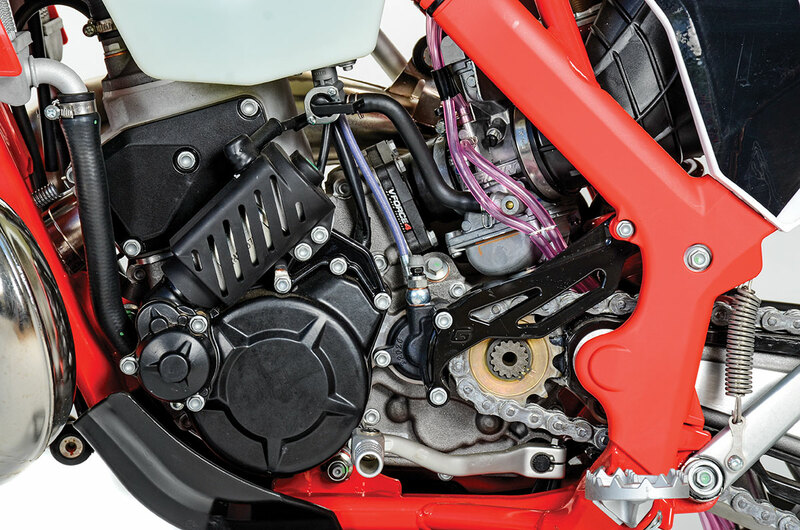 A tidy plastic skid plate protects the clutch and ignition cases from minor hits. The driveline features an O-ring chain that didn’t require any adjustments during testing. The 2.6-gallon tank gave us good range (we were getting 40–45 miles out of a tank). It’s slim and ergonomically sound. The fuel tank holds 2.6-gallons of pre-mix and is slim and easy to move around on. The bars are Neken and a good bend. The grips are glue-on, had good feel but the left starting spinning on the bar after one ride. The electric start button and map switch is on the left side of the bars. Good wide pegs and a nice brake pedal brought no bad comments. The KYB shock drew strong reviews from everyone who rode the machine. It’s fit with a kickstarter, but we never used it. There is no doubt that the strength of the Gas Gas EC300 is handling. The machine is nimble, the suspension is excellent, and the overall feel is planted. The cornering traits are managed with little input by virtue of good suspension balance. In the power department, there were pluses and minuses. From the pro to the trail rider, all would have liked more roll-on. The experts felt it was slightly weak when lugged, and the vet riders wanted to short-shift to carry a taller gear. These were not deal-breakers, as everyone felt at home on the machine and had a big smile on their mugs during the tests. Still, less vibration and more bottom power were on the wish list, especially when we rode it back to back with the KTM 300 TPI machine. On the plus side, it was unanimous that the Gas Gas suspension was stellar and a stronger performer than the KTM WP units. The KTM WP units are super plush but too divey. Bigger pilots demanded stiffer springs on the KTM, whereas a wide range of rider sizes never sniveled about this with the Gas Gas. You set the sag and go! The bottom line is that the Gas Gas EC300 is a very serious machine. It required very little setup, and a wide range of riders took to it immediately. It makes strong mid-to-top power and handles superbly. 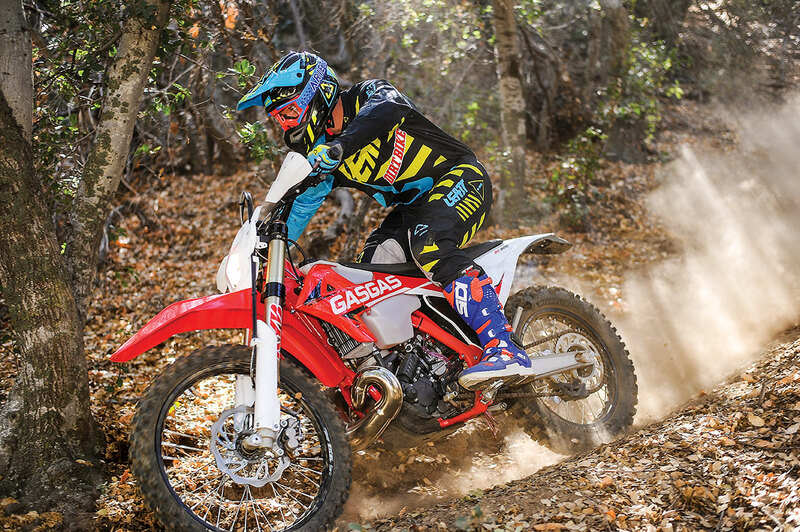 Overall, it’s a strong player in the two-stroke off-road arena.